WE GIVE THEM ENOUGH ALREADY DOGGONE IT! Have you looked around your home and figured out how much money you spend on child related items? You probably haven’t because you don’t want to know the numbers. I don’t know what our cumulative total is either but I do know that “Child Related Expenses” is the 3rd most expensive category in our budget behind food and health insurance. According to the U.S. Department of Agriculture, it will cost a middle-income couple just over $245,000 to raise a child born in 2013 to the age of 18. You may squawk at that and think it won’t be that much but those are the statistical estimates. Aren’t we spending enough to raise them already without having to shell out more money for grades? They should be thankful for everything we already do for them. 1. Being motivated by money alone is lazy. I don’t want my kids to be motivated by money alone. Money is a means to an end. It should be used as a tool to provide for your needs and bless others. There has to be a deeper meaning to life than the all-consuming desire to possess more wealth. I don’t want my kids thinking life is all about money or that they will get money for any task they complete in a positive way. Especially getting it for something so normal as going to school and learning. I see this happen sometimes at home with the chores we assign. A child will complete an additional chore (not one on their chore sheet) that we’ve asked them to do and then they’ll say, “Do I get anything for that?” At which point I give them a pat on the back and a “Thank you” for a job well done. Some things you do just because you are part of the family. I enjoy making more money as much as the next guy. It’s not what ultimately motivates me though and I don’t want it to be what motivates my kids. They need to be motivated to learn for the learning itself and striving hard based on desires that are deeper than money. 2. It puts the teacher in a tough spot. Every class I taught there were students who were on the bubble to being bumped up to the next grade level. In our middle and high school, an A starts at the 90th percentile. So there were always kids with 88s or 89s heading into the final days of the semester. I never did #2. Sometimes I was OK with #1 depending on how the child had performed during the semester. If the 88 had resulted from missed work due to laziness I’d be less likely to offer extra credit. I maintained they should have done the original work in the first place so they didn’t have to come crawling to me at the last moment trying to bail themselves out. Either way it puts the teacher in a tough spot. If the teacher doesn’t offer the extra work then there is a chance the child is turned off at the teacher and blames him or her for “taking away” their financial reward. Instead of accepting responsibility for their effort the teacher is blamed for them not getting money. Once a relationship rift develops it’s awfully hard for the teacher to get that back. To keep that from happening, a teacher might lower his or her standards to “help out” the child get the higher grade (and thus the money). 3. Our kids might not be A students. The final reason we chose not to give our kids money for good grades is that we didn’t know whether or not our kids would be A students. Some kids aren’t. Their giftedness does not lie in academics. Many balk at that idea but I think it’s fine. Not every child is blessed with the same brain power. Or athletic prowess. Or artistic ability. Just ask my son about that because he’s already stressed out about 7th grade Art class. If you tell a child, “I’ll give you $50 if you get an A in math” you’ve just created a lot of stress and especially so if they are not mathematically inclined. Their strength is English or some other subject and they know it. Math doesn’t inspire them in the least, other than to the level they know they must pass it to graduate. It’s how kids are wired. If they can never get an A (and hence the money for that A) you’ve effectively punished them for something out of their control. It’s not in their DNA. Our hang-up has never been on the grade itself. We chose to focus on something far more important. As a teacher and a parent I’ve only ever been worried about one thing – a child’s effort. Grades are important but effort is infinitely more valuable. A strong work ethic will take a child further in life than an A. As a parent you know how hard your child works. You see the ups and downs, the joys and frustrations that come with all the grades they bring home. Your child leaves for school in the morning on Cloud 9 and is picked up at 3:00 pm a blubbering mess because they got a C on a test. Maybe they got the C because they left their study notes at school. Perhaps it was because they were up until 2:00 am the night before Snapchatting. Or was it because they skipped all the homework for that chapter? I’m going to be upset with any of those reasons. But if the C was earned and they did their best, then what more can I expect? If they put maximum effort into their studies I’m content with whatever they achieve. Of course I’ll have to monitor that effort. And it will be up to me to push when needed because kids do have a natural tendency to slack off. But the reward should be for the effort…not the grade. So if you’d choose to reward effort with money or some other tangible item I’d be OK with that. The kid is then linking effort to money, not grades to money. Of course maximum effort is a lot more difficult to judge and quantify. But the mental linkage of “effort/work ethic = money” will have long-ranging implications as they move into adulthood. Questions: How do you feel about this? Would you give your child money for good grades? If so, what’s the reason? 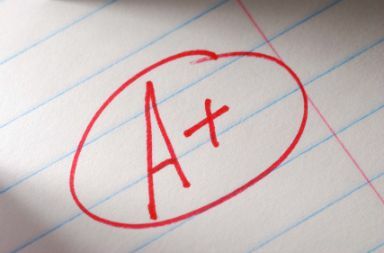 Do you think all kids should strive for A’s? What motivates your children to work hard in school? As a teacher, I can tell you that the kids who work the hardest aren’t always the ones with the best grades. I would hate to teach those kids that their hard work is not good enough and that they haven’t earned the prize, particularly if they’re already ashamed of or frustrated by their grades. We have the “American dream” mindset that if you work hard, you get the desired results, but that’s simply not always true. My father and his siblings studied hard for the future of his struggling family. To get an immediate reward for having good grades can backfire for the kid. Money would be their first “drug” and as your child’s dopamine rush strikes everytime he gets an A+, he wouldn’t struggle for learning anymore. He’ll continue getting the high grades and all but he won’t study at school to learn, he’ll do it just for passing and for the money. Well written article and I totally agree with you! I love #1. I never want my kids to feel like they are solely motivated by money. I want their successes to be driven intrinsically not from some extrinsic force like money or praise. My daughter starts kindergarten this year. Since our home in our old state hasn’t sold, we are renting in a not-so-great neighborhood because it’s really all we can afford (well, we can’t even afford it, but we have high hopes that it’s a temporary situation). My daughter is obviously going to an underprivileged school. I have agonized over what she will wear (nothing too flashy looking). I have agonized over her brand new “Frozen” backpack. I have agonized over what I will pack her for snacks, even. I can’t imagine how it would be if she ever walked in to a school like that and bragged about getting tons of money for good grades. Not only will many of them be struggling with school period, but most of them will be struggling to eat. I’m a bit of a weirdo like this. I probably consider the feelings of other people to an extreme. It doesn’t always stop my approach (my daughter DOES have a brand-new Frozen backpack), but I do stop to think. “…most of them will be struggling to eat.” That’s another dynamic altogether…what it does to the other students who know said child is getting money for grades. I can see potential problems there. Thanks for pointing that out. Awesome post, Brian. We give our kids nothing for good grades because we tell them that performing at their best is its own reward. It feels great to know you’ve put in your best effort and achieved a great result. We help them to earn extra cash by helping them find business opportunities. It’s worked out really well for us so far. I am in complete agreement. Our two kids are still in daycare, but when they are old enough to start receiving report cards, there is no chance we would pay them for earning certain grades. That is just too materialistic and it reinforces the wrong priorities. Oh, I too was a straight A student my whole academic career. I was never paid for my grades. I should go lodge a complaint with my parents for back pay along with interest and late payment fees! Mr. Utopia recently posted…Market Timing Your Retirement Accounts? Donât You Dare! “…lodge a complaint with my parents for back pay…” LOL…nice! You’re right on, Brian. The biggest problem that comes to mind when I hear about something like this is that it would seem to me to put a further burden of legalism on kids. “Do this, behave this way, conform, and you’ll be rewarded.” It tells them to be the “good kid”, the “right kid”. Gives me the heebie jeebies! I agree that it takes away the benefit of learning that money equals work. Money just feels too tied to personal worth in a case like this. “…Money just feels too tied to personal worth…” That’s a good point Janeen. A child’s worth should be based on who they are (character qualities). We shouldn’t confuse them into thinking they are less than they are if they can’t make the grade. We never gave our son money for grades, except on one occasion. He was sooo close to making honor roll one semester (he was in 4th grade at the time), we told him if he made it we’d give him his choice between a go-kart and a desktop computer of his own. He made the extra effort, and chose the computer. But after that, we soon found ourselves in a continuing negotiation with him. When we realized that his effort in school was becoming deliberately commensurate with the rewards offered, we put an end to the rewards. It didn’t take him long to get back on track. I’m just thankful that my wife and I made, and then discovered and corrected our error while our son was still young. “…a continuing negotiation with him.” This is a GREAT point Michael…thanks for bringing up that issue out of your own experience. Kids really know how to twist and manipulate situations to their benefit. The odd thing is that we (as the adults who should no better) always seem to walk right into/fall for it. Nice job on catching that one and putting an end to it before it got out of hand. I think your last point is an especially good one. Not all kids excel at school, and those who do might not excel at all subjects. I think the most important thing is to keep kids excited by and interested in school, and they’re not likely to be interested in something that they feel they’re constantly under-performing at. I like much better the idea of rewarding kids for their effort, and ideally through non-monetary compensation, such as a fun activity to celebrate the end of the semester, or a special meal with favorite foods. These things are worth celebrating, but a cash payment is surely not necessary. And the way I look at it is if they excel and get straight A’s they will most likely get a cash payout one day…it’s called a college scholarship. That’s going to be worth more and feel better to them than the money I could give them now. I agree with all your points. Want kids to get A’s and at the same time hate learning? Give them an extrensic motivators. “…anything more overrated than 4.0 GPA?” Well and being around many schools over the years, not all A’s are created equal. In some schools they are much more challenging to get than others. Although our daughter is not in school yet, I’m pretty positive that we will never give out money for grades. You mentioned a lot of good reasons for this, plus there was the fact that I was always a straight A student and no one ever paid me a dime for grades. Plus I just think it sends a really bad message to kids about how life works. It sends the message that the only reason to work hard in life is if you are being paid. Which is of course not at all reality based. For example, my husband and I work hard at our marriage and no one pays us for this! I just think it is easier to teach a solid work ethic if you help kids derive satisfaction from internal cues (like feeling good because you have your best effort) than external cues (like money). Great post! “…derive satisfaction from internal cues…” I agree completely Dee. The satisfaction gained from meeting and surpassing the internal cues will have a longer lasting impact. And I think it will be a more powerful motivator for future tasks/goals. I rarely give my kids money when they get high grades. What I do is either I treat them or give them a book or something they’d like for their efforts in school. I give them encouragement and piece of advice on the results of what they have done so that they create a big picture that efforts are more important than money. A tangible asset, books, words of encouragement, advice…all better things to give than money.